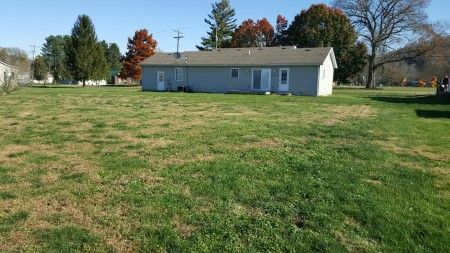 The asphalt drive leads to this NICE One floor plan, 3 bedroom, 2 bath home with attached garage and front covered patio porch. The home offers vinyl siding, shingle roof, county water, 200 amp breaker box, electric furnace and central A/C unit. It has a nice flowing layout accented by the owner's suite bedroom with attached full walk in shower bathroom. There is also a utility/mud room with washer/dryer hookups, Kitchen/Dining/Living Rm Combination, the kitchen has top & bottom cabinetry and dining area leads to sliding glass doors to rear patio. 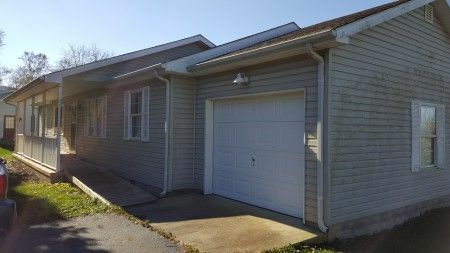 There are two additional bedrooms with closets and a full bath shower over tub plus an office area/bonus room. The attached garage has a concrete floor and overhead door opener. Real Estate Terms: Minimum Bid is $84,000.00; $5,000 down at time of sale in cash or check, Balance & Possession at closing/upon delivery of deed on or before March 8, 2019, Offered free & clear prior to closing, Sold As-Is, No buyer's contingencies exist, Taxes Pro Rated to Closing.